The journal publishes research papers in the fields of management, business law, public responsibility and ethics, marketing theory and applications, business finance and investment, general business research, business and economics education, international business and economics, tourism and hospitality management, production/operations management, organizational behavior and theory, strategic management policy, social issues and public policy, management organization, statistics and econometrics, personnel and industrial relations, gender studies, cross cultural studies, entrepreneurship development, linguistics, library science, media studies, methodology, philosophy, political science, population studies, public administration, sociology, social welfare, technology and innovation, case studies , management information systems, information technology, marketing, finance, economics, banking, accounting, human resources management, international business, hotel and tourism, entrepreneurship development, business ethics, international relations, law, development studies, population studies, political science, history, journalism and mass communication, corporate governance, cross-cultural studies, public administration, psychology, and so on. Business innovation and research strategies, tactics and tools of both theoretical and practical nature are welcome. IJEMS also publishes original research, creative work, and critical discourse on traditional, contemporary, and popular issues in arts and issues in the field as mentioned above. Contribution can be in the form of conceptual or theoretical approaches, case studies or essays in the field of Economics, Management Sciences. 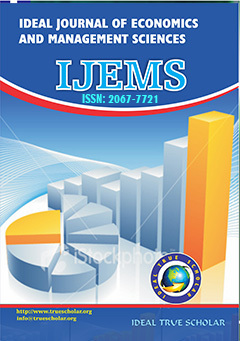 IJEMS welcomes submissions in any of the seven categories (i) Research Article (ii) Research Note (iii) Research Essay (iv) Research Commentary (v) Theory and Review Article (vi) Issues and Opinions (regional or global) (vii) Case Report. Any manuscript submitted to the journal must not already have been published in another journal or be under consideration by any other journal. Manuscripts of papers presented at conferences can be submitted unless they have been published as part of the conference proceedings in any journal. Authors are required to ensure that no material submitted as part of a manuscript infringes existing copyrights, or the rights of a third party. Authors who publish with Ideal Journal of Economics and Management Sciences need to transfer copyright to their work to this Journal to make it open access paper to the global readers. Ideal Journal of Economics and Management Sciences (IJEMS) is committed to upholding the highest standards of publication ethics and takes all possible measures against publication malpractice. It is based, in large part, on the guidelines and standards developed by the Committee on Publication Ethics (COPE). Authors who submit papers to IJEMS attest that their work is original and unpublished, and is not under consideration for publication elsewhere. In addition, authors confirm that their paper is their own; that it has not been copied or plagiarized, in whole or in part, from other works; and that they have disclosed actual or potential conflicts of interest with their work or partial benefits associated with it. The editors and any editorial staff must not disclose any information about a submitted manuscript to anyone other than the corresponding author, reviewers, potential reviewers, other editorial advisers, and the publisher, as appropriate. IJEMS adapted Open Journal System (OJS) a well known system for scholarly open access journal that prevents unauthorized access to its unpublished contents. In the case of a misconduct investigation, IJEMS may disclose material to third parties (e.g., an institutional investigation committee or other editors).